California's unfunded public pension liability, when measured correctly, is two to four times larger than official government estimates. 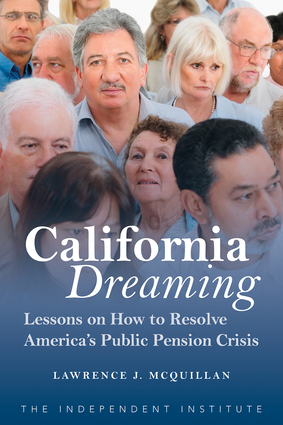 In total, California's 86 defined-benefit public pension plans are underfunded by roughly $430 billion, representing California's greatest financial challenge since the Great Depression. The failure to fully fund the pension promises has allowed the current generation to receive public services that they are not fully paying for, pushing the pension problem onto future generations. California Dreamin': Resolving the Public Pension Crisis explains how six reforms would solve the state's pension problem in an equitable, responsible, and moral way: preserving pension benefits already earned, providing competitive pensions going forward, and granting the flexibility needed so that future generations are not paying for deals they did not make. Lawrence J. McQuillan is a senior fellow and the director of the Center on Entrepreneurial Innovation at the Independent Institute. He is the author of several books, including A Brighter Future: Solutions to Policy Issues Affecting America's Children and Jackpot Justice: The True Cost of America's Tort System. His articles have appeared in numerous publications, including the Chicago Tribune, Encyclopaedia Britannica, Forbes, Investor's Business Daily, the New York Times, and the Wall Street Journal and has appeared on various television and radio shows throughout the country. He lives in Fremont, California.